Meiji gold Proof 20 Yen Year 3 (1870) PR66 Cameo NGC, KM-Y13, JNDA 01-1. As the largest gold denomination of the period, the undeniable 'king' of this unbelievable first coinage presentation set. Well-matched to the other gold issues, the fields possess highly refined reflectivity, with graces of orange-red patina that reflects ages of untouched storage. As the Cameo designation suggests, soft frost over the design results in evident contrast between the raised surfaces and flat fields. Upon closer inspection, very faint specks of die rust exist in the reverse fields, a shared trait with several other pieces from this set. Altogether, a sublime presentation, and certainly unique or nearly so in this is proof quality. An offering of undoubtedly historic magnitude and as such, a coin that in all likelihood should fly past its conservative estimate range. The surrounding nine lots, consisting of silver and gold coinage that dates to 1870 and 1871, remains a wonderful enigma in their superbly crafted proof condition. While research is constantly uncovering history that has been lost through the course of time, very little information regarding the existence of these coins has been brought to light. Nonetheless, as the first proof coinage of modern Japan, their numismatic importance cannot be oversold. Struck during the infancy of Japan's opening to the West, proofs of any kind from the 19th century are very rare. While the reason for the existence of proofs is generally not documented, scholars typically agree that diplomatic or royal presentation as well as exhibition at fairs are the primary occasions; some, through authorized or perhaps nefarious production, were also likely made for mint officials and employees. The "fabric" of this set, each coin showing narrow rims and uniform watery-mirrored reflectivity in the fields, is unlike any of the other proof dates observed during the first decade of presentation coinage that appears from the Osaka mint. We believe this suggests the set was actually manufactured sometime after this period, for display at a fair or exhibition or as a gift to royalty. This theory actually compliments the set's rarity, as either scenario would infer a maximum mintage of no more than a couple examples. It also provides likely answers to the vexing question surrounding the 5 sen and 50 sen issues (see individual lot descriptions for more). As an attendee of the 1892-1893 World's Columbian Exhibition, Japan is known to have produced several unique coins dated 1892 for display at this massive world-wide get-together. Two such pieces were sold in our offering of the Norman Jacobs collection in 2011, where a small silver 5 sen brought $276,000, while the smallest circulating denomination of the period, a rin, brought $63,250. Given this precedent, it's entirely possible that old dies from 1870 and 1871 were retrieved from mint archives and re-worked to proof specifications in order to showcase Japan's first coinage. While this could have occurred at the World's Columbian Exhibition, it's also entirely plausible that these could have been produced for another exhibition that was attended by Japan. The second possibility is that these coins were gifted to royalty. While no direct proof of any such gift from Japan is known, circumstantial evidence suggests the possibility. From the 1954 Sobethy's sale of The Palace Collections of Egypt, the collection of King Farouk of Egypt, we note lot 1366 was described as containing all the gold coins in proof that are seen in this auction. Although the present coins are not pedigreed to Farouk, the rarity of the coins themselves provides a high probability that these are in fact the Farouk coins. While it fails to mention the silver coinage, the legendary clumsiness of the catalogers in the sale could have altogether dismissed the silver as unimportant to the description, or the silver proofs could have been placed in lot 2605 where there is mention of anonymous "small silver (69)". Even if true, the direct link of these coins being a gift to Farouk cannot be definitive, as they could have been struck under our first scenario only to be added to Farouk's collection at a later date. While somewhat a non sequitur, it's also interesting to note that a Japanese gold proof set from 1880 was sold in the following Farouk lot, with both lots realizing £90 in the sale. In January of this year, we sold examples of the same Japanese proofs (excluding the gold yen proof) for in excess of $850,000. 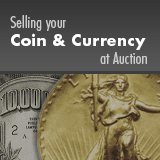 Including the silver coinage, our recently offered 1880 set brought in over $1.3 million. Whatever the actual reason, the lots that follow represent absolute treasures from Japan's numismatic history. Offered in remarkable gem condition, we hope all who attend the sale will take the opportunity to view, as many with decades of seasoned numismatic experience are just now hearing about this set for the first time, and once the sale concludes, many will likely never have the opportunity to see them again.